Heat oven to 400°F. In small microwavable bowl, microwave butter uncovered on High 30 to 60 seconds or until melted. Stir in pecans, brown sugar and syrup until well blended. Spread in ungreased 11x7-inch (2-quart) glass baking dish. Separate dough into 8 triangles. Cut each triangle lengthwise into three smaller triangles to make 24 triangles. 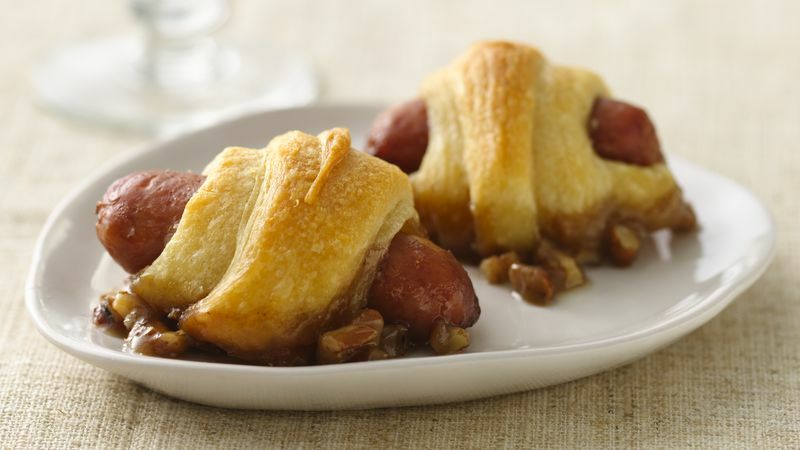 Place 1 sausage on shortest side of each triangle and roll up, starting at shortest side, rolling to opposite point. Place sausage rolls point sides down in baking dish, making 3 rows each of 8 sausages. Bake 15 to 20 minutes or until rolls are golden brown. Remove from baking dish to serving platter while still warm. Serve warm or cool.